SJM 8004 calls on President Donald Trump, Vice President Mike Pence, Congress, the federal Bureau of Reclamation, and the Army Corps of Engineers to "take any and all action within your authority to prevent the breaching of any dam in the Columbia River system." Sheldon added, "I think people that are involved in the industry, and those who receive power from it, whether they know it or not, are certainly going to be affected by that action if this could ever go forward." Honeyford agreed, highlighting the impact of the port's closure should the dams be breached. "If you're shipping grain, it's usually payable at the port. If it goes by truck, it's going to increase costs. Bottom line is, (a) farmer would have less income, because he's paying more to get his product to the port." A 2016 State of the Salmon Report presented by officials from Governor Jay Inslee's Salmon Recovery Office January 19 to the Senate Natural Resources and Parks Committee showed inequitable salmon recovery rates among endangered Washington salmon and steelhead. Six species are increasing in population; two are Snake River salmon and steelhead. The Snake River fall chinook is one of two species approaching federally-approved recovery goals to take them off the endangered list. Four species' populations remain stagnant, while another three continue to decline. However, none of them are Snake River species. In contrast, Judge Michael H. Simon insisted in his May ruling that a new environment impact statement due by March 2018 "may well require" breaching the Snake River dams to help endangered species recover. The Bonneville Power Administration (BPA) has concluded that doing this would cost $2.6 billion. BPA jointly operates the dams with the Corps of Engineers and the Bureau of Reclamation. However, Congressional approval would be needed to breach the dams. 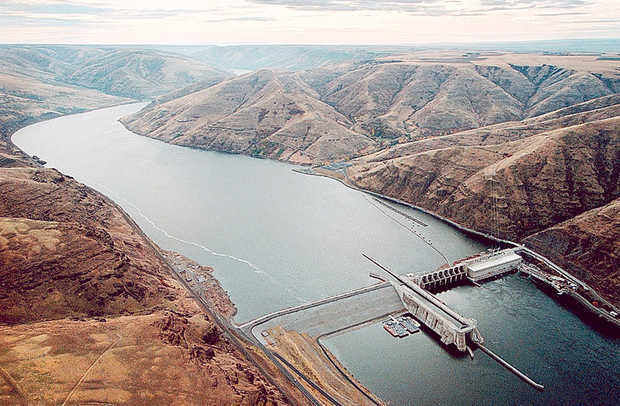 Washington Rep. Cathy McMorris Rodgers (R-5) has already expressed commitment to preserving the dams. In addition to the progress already made with some Snake River salmon populations, decision-makers might also take into consideration other factors that can negatively impact recovery. Predatory marine animals can consume half of adult spring chinook coming in from the ocean before they reach one of the Lower Snake River dams. That is according to Snake River Recovery Board Director Steve Martin, who told panel members January 19 that salmon predation "is a very significant challenge that we face today," especially in the Snake River region. "There are challenges out there, but we are making progress by adaptively managing the environment," he said. Salmon can also end their journeys prematurely in one of the 35,000-40,000 fish barriers located throughout the state on both private and public land, according to a January 24 joint presentation to the House Capital Budget Committee. That includes 996 culverts managed by the Washington State Department of Transportation (WSDOT). Of those, 884 affect "significant habitat," with 475 requiring mitigation by 2030. The Fish Barrier Removal Board created by the state legislature in 2014 is requesting $20 million in the 2017-19 capital budget for 13 barrier removal projects planned along 43 miles of habitat. Two of them are in the Snake River region. However, some fishing and conservation groups oppose SJM 8004, arguing the state should let the EIS determine what should be done to the dams. Save Our Salmon Coalition Executive Director Joseph Bogaard told panel members January 31 that the legislation turns "the potential removal of four high-cost, low-value dams on the lower snake river into a misleading defense or conversation about all the Columbia river projects in the basin." "We've got to find a better way forward," he added. "I don't know anyone who's actively working to restore salmon by removing any of the dams on the Columbia River proper. Taxpayers deserve a full and fair assessment of its (dam breaching) true cost and benefits." Bogaard downplayed the power produced by the four dams in comparison to the total electricity generated in the region, saying they can be replaced by renewable energy sources such as wind and solar. He added that rail could make up for the loss of the port, albeit "there would necessarily be some additional investments." However, Honeyford was skeptical of both proposals. He told Bogaard that "wind power is not effective or efficient in winter and summer, when the temperatures are high or low, when the demand is high, and so I think that would not be one that we would want to use." He added that "solar requires heavy subsidizations. Rail right now as I understand, along the Columbia, is probably pretty close to maximum, so I'm not sure that there would be much more traffic capability there."